Welcome to our Perimeter of Rhombus support page. We will explain how to find the perimeter of a rhombus and show you some worked examples. When we are trying to find the perimeter of a rhombus, we use the geometric properties of a rhombus to help us. A rhombus is a 4 sided polygon with all sides equal length. It's opposite angles are also equal. The fact that all 4 sides are equal in length helps us to find the perimeter. To find the perimeter of a rhombus we simply need to find the length of one side and multiply it by 4. If the length of the sides is not known and the shape is not drawn to scale, then we move on to the harder version lower down the page! Perimeter of a Rhombus - Easier Version! Find the perimeter of the rhombus below. The rhombus has sides of length 5cm. So to work out the perimeter we need to add up the length of all four sides. So the rhombus has a perimeter of 20cm. Find the perimeter of shape below. This rhombus is actually a square, as the angles are all right angles. To work out the perimeter we need to multiply the length of one side by 4. So the rhombus has a perimeter of 24cm. This rhombus has sides length 3 ½ cm. So 3 ½ cm x 4 = 14cm. So the perimeter of the rhombus is 14cm. Find out the length of the sides of this shape. This rhombus has a perimeter of 32cm and we need to find out the length of the sides. So 4 x side length = 32cm. This means that the side length must be 32 ÷ 4 = 8. So the length of each side of the rhombus is 8cm. Perimeter of a Rhombus - Harder Version! If we do not know the length of one of the sides of the rhombus and it is not drawn to scale then we will need to use other geometric properties and rules to help us. If, for example, we know the perpendicular width and height of one of the sides (see image below) then we can use Pythagoras' theorem to help us. If you look closely at the shape made by the perpendicular width (x) and the perpendicular height (y) and the missing side of the rhombus (h), you will see that it makes a right triangle. You can see that the missing side (h) is the hypotenuse of the triangle made by the two shorter sides, x and y. So to find the perimeter of a rhombus above we need to use Pythagoras' theorem to find the missing side - the hypotenuse - and then multiply the result by 4 to find the perimeter. We know the perpendicular width and height of one of the sides so we can use Pythagoras' theorem to find the hypotenuse which is also the side of the rhombus. 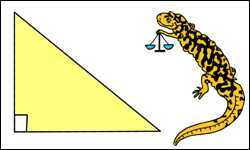 Pythagoras' theorem says that the square of the two shorter sides (legs) on a right triangle is equal to the square of the longest side (the hypotenuse). So if h is the longest side (or hypotenuse), then h2 = 62 + 82. This gives us h2 = 34 + 64 = 100. So h=√ 100 = 10cm. So the length of one of the sides of the rhombus is 10cm, so we need to multiply this length by 4 to give the perimeter. The perimeter of the rhombus is 4x10 = 40cm. Find the perimeter of the rhombus below correct to 1dp. Once again, we know the perpendicular width and height of the side, so we can use Pythagoras' theorem to find the length of the side. So if h is the longest side (or hypotenuse), then h2 = 72 + 42. This gives us h2 = 49 + 16 = 65. 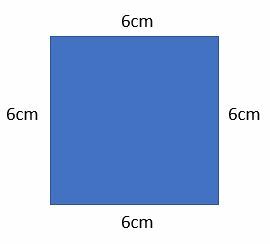 So the length of one of the sides of the rhombus is √65 cm so we need to multiply this length by 4 to give us the perimeter. The perimeter of the rhombus is 4x √65 = 32.2cm to 1dp. This time we have been give the total perpendicular width and height of the rhombus. However, we only need to perpendicular height and width of one side, so we need to halve the measurements. 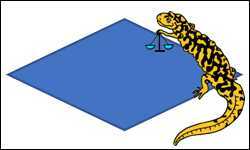 The perpendicular width of one side is 30cm ÷ 2 = 15cm. The perpendicular height of one side is 16cm ÷ 2 = 8cm. So if h is the longest side (or hypotenuse), then h2 = 152 + 82. This gives us h2 = 225 + 64 = 289. So h=√ 289 = 17cm. So the length of one of the sides of the rhombus is 17cm so we need to multiply this length by 4 to give us the perimeter. The perimeter of the rhombus is 4 x 17cm = 68cm. Sheet 1 is an easier sheet which involves measuring the sides of the rhombuses with a ruler and adding them up to find the perimeter. Sheet 2 is an easier sheet which involves multiplying the length of each side by 4 to find the perimeter. 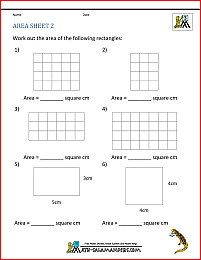 Sheet 3 is a harder sheet which involves using Pythagoras' theorem to find the missing side - with integer answers only. Sheet 4 is a harder sheet which involves using Pythagoras' theorem to find the missing side giving answers to 1dp.